It’s only a few weeks ago that gold comprehensively headed up through the psychological $1300 dollar an ounce level, giving the bulls something to cheer about. However, that sortie was short-lived with price just as convincingly heading back down through that inflection point. There is room for lower prices based on the technical picture which we’ll discuss below although we aren’t expecting a significant retracement. Better data out of the US and China is a headwind for the yellow metal as traders and investors are more inclined to look at riskier assets. The flipside is that safe haven assets like gold will usually head in the opposite direction. However, there are still geopolitical risks to provide a backdrop, with Brexit being the obvious one that comes to mind. Despite all the reports and tweets from officials suggesting that the US-China trade talks are going well, nothing is set in stone meaning it’s still a potential bearish trigger for stocks. Remember, the market doesn’t like uncertainty and although this isn’t the case now, it could be an issue further down the track. The Federal Reserve remain dovish which is also likely to support the precious metal. → geopolitical risks still remain in the background. “…What we could also have forming here is a bullish cup and handle pattern. The cup now appears to be in place with price sitting right at the lower boundaries of a supply zone circa 1350 – 1400. Combine this with the Type-A bearish divergence that is now in play, then there is certainly scope for a breather…”. These were Scott's thoughts during his last review and we haven’t been disappointed, with a retracement unfolding over the past few weeks. The Cup & Handle is also continuing to form very nicely and appears to be in its latter stages. 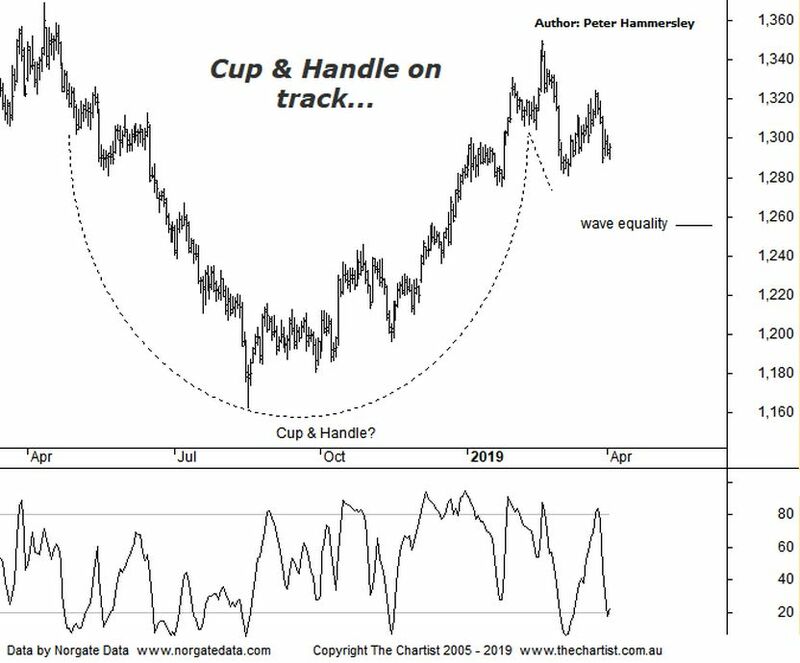 The Cup is already in place, with the handle possibly taking price down toward the wave equality projection as annotated. This would complete a symmetrical 3-wave movement down and set up a potential buying opportunity. However, it’s not a prerequisite to higher prices to head just beneath 1260, with a sideways move being just as textbook regarding the C&H continuation pattern. As long as the smaller degree patterns hold firm, there is plenty of upside potential though it’s likely going to take a few weeks before a more significant breakout materialises – assuming it does. The bearish divergence noted last time did prove to be significant although our oscillator has now headed down into the oversold position meaning it’s no longer a headwind. If you look at enough charts, you’ll note that Type-A bearish divergence usually proves to be significant one way or the other. We’ll look at the weekly chart during the video although suffice to say, price has been stuck in a trading range since 2013 which needs to be broken before getting too excited. A push above 1432 in a move that sticks is required although that’s something to consider much further down the track. We continue to hold our long position from 1216 meaning we are in a strong position. However, we are going to leave our stop loss at 1167 which will keep us out of the noise during any short-term weakness, which is feasible. The aim is to ride the trend as far as possible which is something we can never do if we are too aggressive with the protective stop – or take profits early. If you aren’t already involved it’s best to stand aside although another opportunity could arise should price hit the wave equality projection and reject.